Law firm represents veteran in becoming one of the first to prove that brain cancer was caused by contaminated water at Camp Lejeune, allowing his claim for benefits to move forward. Partner David Russotto of the Marcari, Russotto, Spencer & Balaban law firm recently assisted a veteran to become one of the first to be eligible for veterans disability benefits for a health condition based on exposure to contaminated water at the U.S. Marine Corps Base Camp Lejeune in North Carolina. According to court documents, the client in this case is suffering from medulloblastoma, a type of brain cancer. His attorneys were able to establish that his condition was related to exposure to carcinogens in the water at the base while he was stationed there between 1984 and 1986. This is one of the first times that a veteran has become eligible for disability benefits for any disability related to the environmental conditions at Camp Lejeune. While the government currently allows at least 15 health conditions to qualify veterans to receive healthcare at VA facilities due to exposure to solvents, benzene and other chemicals in the water at the Marine Corps Base, the Veterans Administration, to date, has been largely unwilling to allow veterans to become eligible for the payment of disability benefits due to exposure to these contaminants. This case required the testimony of an oncologist as an expert witness to establish and support a likely connection between the veteran’s exposure and his illness. Court documents show that previous attempts in 2011, 2013 and 2014 by this veteran to establish service connection and apply for veterans disability benefits were unsuccessful. However, in light of the expert opinion of a highly qualified oncologist, citing the veteran’s rare condition was likely caused by his exposure to the contaminants in the water at Camp Lejeune during the time he spent there on active duty, the Board of Veterans Appeals found his cancer was related to exposure to contaminated groundwater. 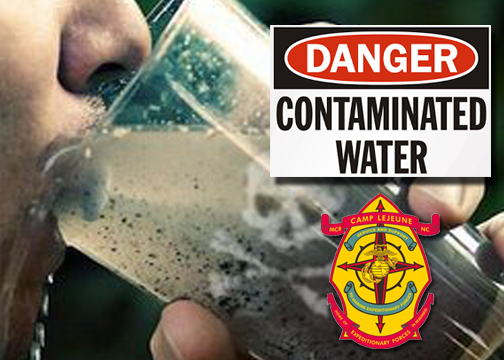 “While this is one of the few times that the VA has acknowledged a veteran’s illness was actually caused by exposure to contaminated water while stationed at Camp Lejeune, I am hopeful that in the near future this will become the norm rather than the exception.” said Attorney David Russotto. The case is DOCKET NO. 14-07 788 before the Board of Veterans Appeals.